Davey D speak with Oakland-based educator, emcee and activist Maddy “MADlines” Clifford about incarcerated youth, toxic masculinity, and her new music projects. Maddy believes in poetry’s power to transform, heal and empower communities impacted by trauma. Her faith is rooted in her own personal journey of self-discovery and resilience through hip hop lyricism, writing and performance. 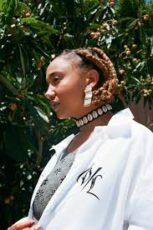 Maddy has been rapping for the past fifteen years, first as a Youth Speaks Seattle Slam Champion and later as an avid performer based in Oakland. She has spent the past eight years teaching poetry in detention centers, after school programs, college campuses—even as far away as Uganda. Maddy holds an MFA in Poetry from Mills College; her expertise allows her to lecture, curate, rock crowds and create music that speaks to contemporary politics. Stay up to date on her most recent projects below.